(Nanowerk News) Scientists and engineers at Lawrence Livermore National Laboratory are now developing the electronics for a third-generation artificial retina as part of the U.S. Department of Energy (DOE) project to produce an “epiretinal prosthesis” that could restore vision to millions of people around the world suffering from eye diseases. R&D Magazine chose the second generation artificial retina, Argus II, for a 2009 R&D 100 Award. R&D Magazine issues the R&D 100 Awards, also called the “Oscars of invention,” every year for the most innovative technologies in science. The Lawrence Livermore team received the award in November 2009. The Lawrence Livermore team also was chosen as the R&D100 Editor’s Choice as one of the most ground breaking technologies. The DOE artificial retina project brings together five national labs, four universities and a private company, with Lawrence Livermore National Laboratory serving as the lead organization for the implantable artificial retinal system. In addition, Lawrence Livermore is responsible for the system integration and assembly of these components and fabrication of the complete implantable artificial retina system. 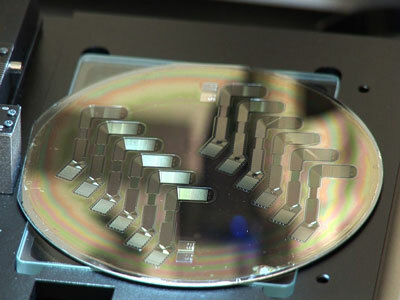 Each artificial retina wafer created in the cleanroom at LLNL holds a dozen arrays. An artificial retina or “epiretinal prosthesis” has the potential to restore vision to millions of people suffering from eye diseases such as retinitis pigmentosa, macular degeneration or those who are legally blind due to the loss of photoreceptor function. In many cases, the neural cells to which the photoreceptors are connected remain functional. Dr. Mark Humayun, of the University of Southern California’s Doheny Eye Institute, demonstrated that electrical stimulation of the viable retinal cells can result in visual perception. These findings have sparked a worldwide effort to develop a retinal prosthesis device. The R&D 100 Award has been given to the second-generation retinal prosthesis, which has been implanted in some 34 patients in the United States and Europe as part of clinical trials. The second-generation device represents a substantial performance improvement over the first-generation device in speed of recognition and resolution. Objects can now be recognized within 2-3 seconds instead of the previous 15, and the device’s 60 electrodes have improved image resolution over the 16-electrode prosthesis. The artificial retina team was established through a Department of Energy-sponsored Cooperative Research and Development Agreement (CRADA) in 2004.